Merry Christmas! I went to SC to see my mom and family and am already back in Austin. Time really flies when you are having fun. I had a great trip, I only wish I could have stayed longer! Mom and I took a little trip to Winston Salem to check things out. I am planning to move there but have only been there a few times, so I wanted to start exploring a bit. Quite a risk but it all seems right. We drove around and looked at neighborhoods and houses. 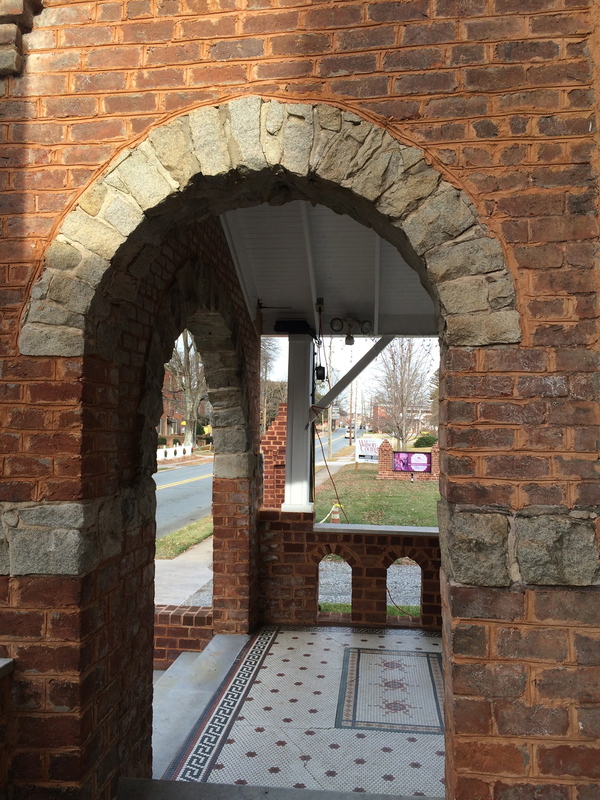 We took a detour over to Kernersville, which is a little further east. We visited Korner's Folly, a house turned museum that was built in 1880. It was the home of Jule Korner who was a designer/artist who used the house as a real-life display of his home designs and all the variety of floors, moldings, doors, fireplaces, etc that he designed. It is in a bit of disrepair, but was so fun to visit. It was decorated for Christmas and although that was nice, the decorations hid a lot of the house and period furniture. I'll go back to see it when the "Christmas" is all removed. Here are a few pictures so you can see it as well…. I cooked quite a bit while I was home. 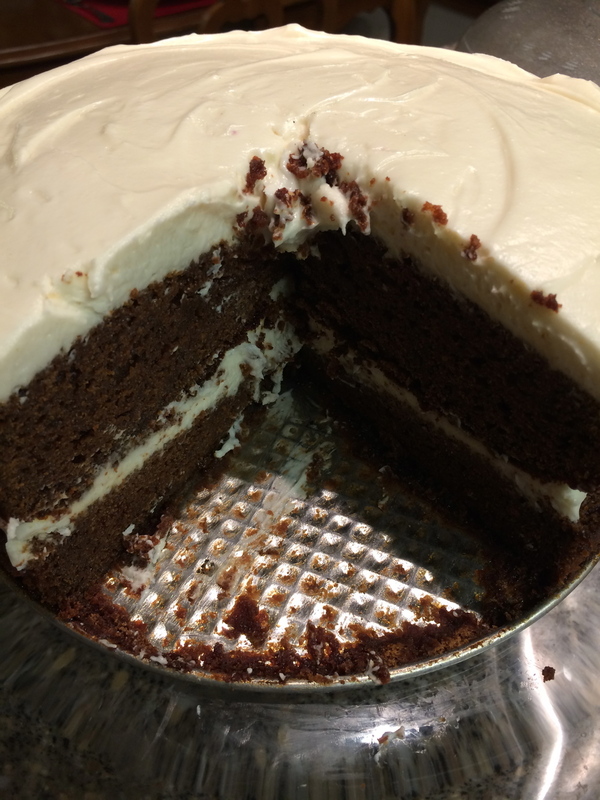 I made this awesome cake from The Kitchn, Dark Gingerbread Cake with Cooked Cream Cheese Frosting. It is not exactly health-supportive but is delicious for a special occasion like Christmas. Once you try this cream cheese frosting you will never go back to your old recipes. 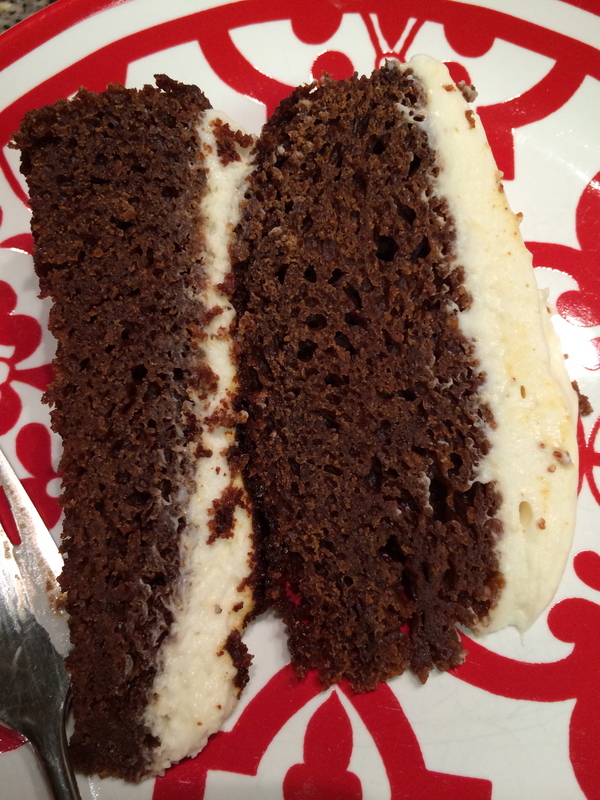 This one is made with only cream cheese and a paste made of milk, flour, and sugar. No butter! It is delicious…The picture doesn't do it justice. I went for a couple of walks/jogs even though it was cold. I love being out of the city where it is quite and peaceful. There are few cars and the scenery is always beautiful. Cows to watch you go by, birds singing, and geese honking. One of my favorite parts of visiting. I also walked some paths through the woods beside my parents house. My dad spent many days clearing paths, removing shrubs and weeds….creating a winding, beautiful walkway. My cousin Doug keeps them all cleaned up which is such a gift for us. When I walk them it's like having a visit with my dad, a very nice way to celebrate the holiday! For one meal I made a version of something we made in school. You grate cauliflower and cook it with some almond meal and broth to make grits. I admit they really don't taste like grits but the texture is good and it is a great way to eat a vegetable instead of a starch like rice or corn. We topped it with mushrooms cooked with onion and peppers, seasoned with Cajun seasoning. In school we used portobellos but at home we used baby bellas and button mushrooms. The sauce is made of thickened broth, in this photo a dark mushroom broth. If you use vegetable broth your color will be lighter but still taste great. This is a great vegetarian/vegan/gluten free meal. Serve with a salad or some broccoli and dinner is served! I hope you have a really happy Christmas, with all your family and friends. And whether you celebrate or not, I hope you eat something delicious! Trim the cauliflower of any large leaves. Using a large knife cut the head of cauliflower in half and then cut out the tough core. Cut each half into two or three pieces. Using a box grater or the grating blade on your food processor, grate the cauliflower until small rice sized pieces. Mix the cauliflower, almond meal and stock in a large shallow skillet. Add a big pinch of salt and a few grinds of pepper and mix well. Heat over medium heat until mixture starts to bubble then reduce heat to make a nice simmer. Cook stirring occasionally until all the liquid is absorbed. Taste for seasoning and adjust as needed. Serve. In a large skillet heat the oil over medium heat. When hot, add the celery, onion, pepper, and mushrooms and cook until softened and starting to brown. Add the Cajun seasoning and mix well. Mix the stock, sherry and lemon juice together. Stir in cornstarch to make a slurry. Add to the pan and adjust heat to medium high. Stir the pan well, scraping any browned bits from the bottom of the pan. Bring to a boil, then reduce heat and stir until thickened, 5 - 8 minutes. Taste and add salt and pepper as needed. Serve over the grain of your choice, or cauliflower rice.